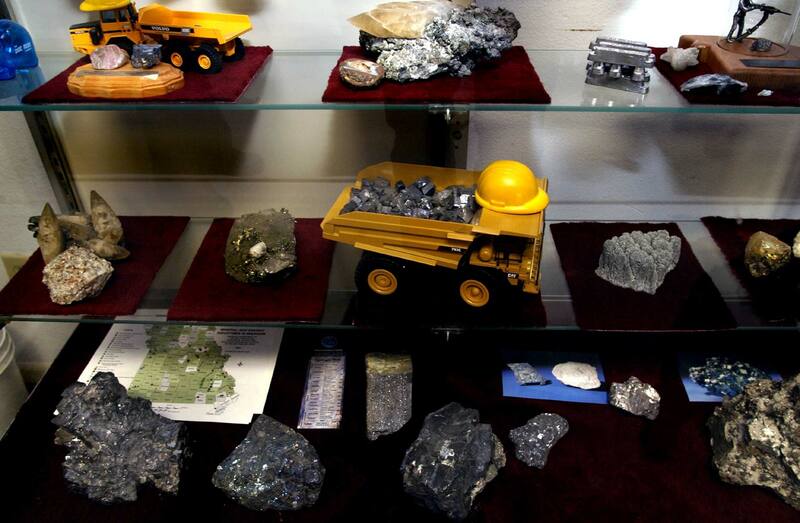 A display cabinet at Doe Roe Lead Company showcases galena-- the bluish, gray, or black mineral of metallic appearance, consisting of lead sulfide that is the chief ore of lead found throughout the Old and New Lead Belts in Missouri. Missouri is still the nation's biggest producer of lead, and Washington County is one of its mine-waste cleanup sites. Since 2005, hundreds of families across rural Washington County have learned that they were exposed to contaminated soil or water because of mining that once took place here. State geologists have identified more than 9,000 places in 38 counties where lead, barite, zinc and copper once were found, and in most cases mined. In Washington County alone, federal regulators plan to spend up to $8.5 million on cleanup. So far, 213 contaminated yards here are targeted for soil removal, and bottled drinking water is being delivered to 244 homes served by private wells that contain elevated levels of lead and other contaminants.